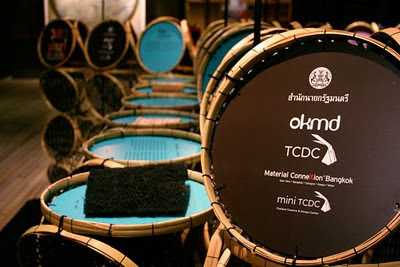 Last month , we have set up our 2nd exhibition at TCDC, “Materials from Nature”, with our beloved clients, Materials Connexion BKK. 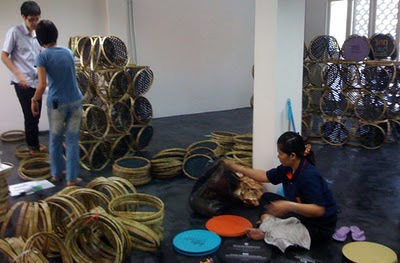 The exhibition will be running until the beginning of April 2010 at TCDC, then will be traveling around the country to miniTCDC. 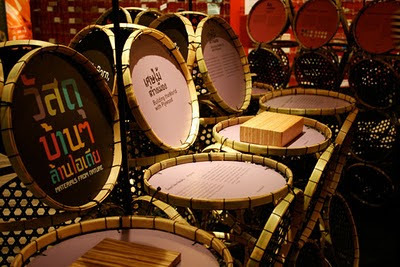 This time, although we got the same team from “Green Packaging”: Wuttinan the curator, Chatnarong & Piyapong the graphic, Purich the supporter as well as Tanakul the contractor, the process of designing and building was quite challenging.. we have learned a lot about our country & society from a rather anthropological viewpoint! 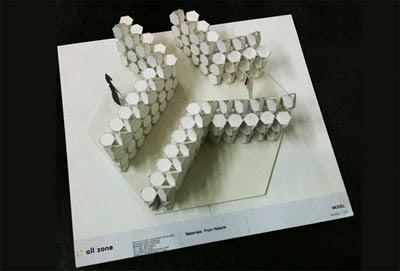 Being an architect / a designer is always a great fun! 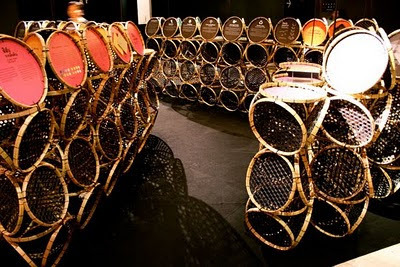 The idea began with using local natural materials as a main part of the exhibition, to emphasize also on the possibilities of the materials around us. 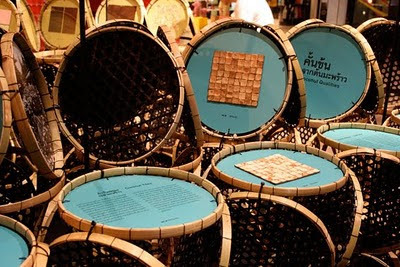 Another place we went (later) and found an incredible thing is Panasnikom, Chonburi, where the have the biggest woven baskets in the world -_-” We started with this idea to make a hexagon module which could be assembled in several forms. But they could not make it strong. 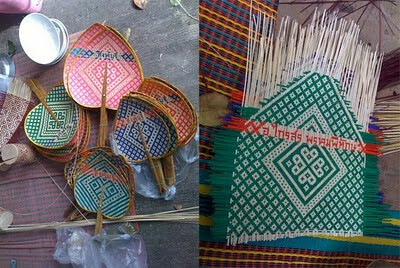 So we found some examples of what could be our next exploration — this flat basket or กระด้ง which is very strong structurally because they rim is made out of thick bamboo. 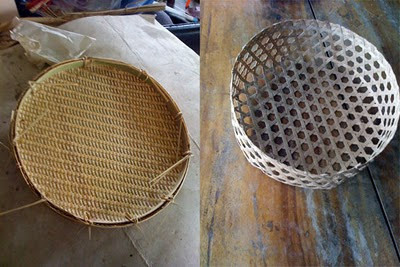 Moreover, they can make it exactly the same size because they use a plastic bucket as a mold. 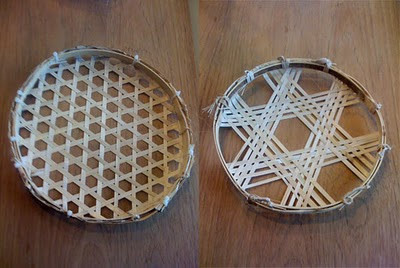 The other interesting piece is this small basket with hexagon pattern which we usually use it for steaming food. The combination of the two began. This is our first trial. 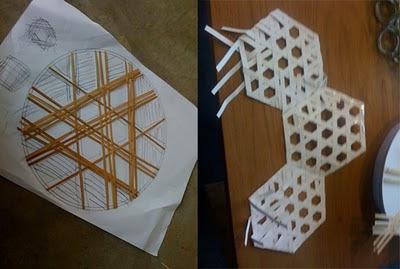 We actually did try several patterns, size and colors. Also we did explored several ways to assemble these rings together in a strong and proper shapes to exhibit our cool materials. This is the final module. The final model of 1:25 scale. 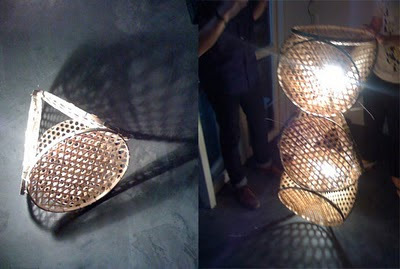 Since the module is rather complex in the geometry, we had to assemble them ourselves at all(zone)’s headquarters. After a complex setup test at all(zone), we moved the almost completed exhibition to TCDC. The setup there took only few hours! a big step forward from our previous exhibition. This graphic is mainly done by our super graphic designer Chatnarong Jinsupathada. 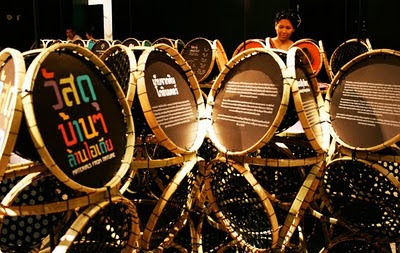 He explains in depth the graphic of this exhibition in his blog. 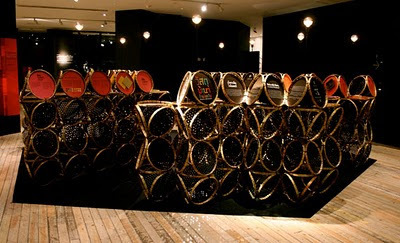 There are several types of Materials from Nature in this exhibition. They are catagorized by different colors. 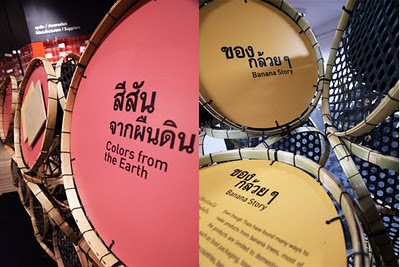 The bamboo structure of the exhibition “Materials from Nature” was made by villagers in the district of Bang Pahan in Ayutthaya and the district of Panatnikhom in Chonburi. 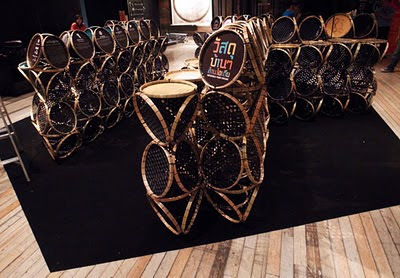 It demonstrates a strong dedication of TCDC and Material Connexion® Bangkok to encourage Thai people to tap into limitless potential of materials and local crafts, which are part of the rich intellectual capital of the country. —-> Yes, We share!